Opposite Jack Black, the filmmakers of Columbia Pictures' family comedy “Goosebumps” cast so many of author R.L. Stine’s famous monster creations. The film brings the Goosebumps book series to life on the big screen for the first time, starring Black as the famed writer. Leading the way as the chief villain is Stine’s most lasting creation: Slappy the Dummy. In the film, Slappy is Stine’s alter ego and the mastermind behind the evil plot. 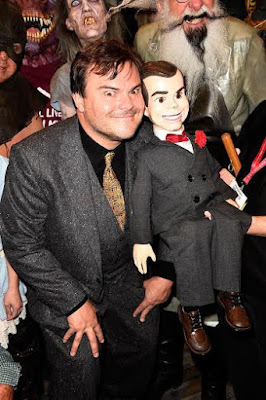 The filmmakers reached out to Ironhead Studio to design and create a real, working ventriloquist’s dummy – one that resembles Jack Black in many ways. The dummy was entirely manual – no electronics at all – and puppeted by Avery Lee Jones, who got the job after a nationwide audition. Jones could move Slappy with his hand controls in many different ways: head turning side-to-side or all the way around, mouth control, eyes side-to-side, eyes blink, wide eyed, and eyebrow movement. Overseeing the working of the dummy itself, to make sure that everything remained in working order, was Ironhead Studio’s Jake McKinnon. Joining Slappy in the film are many of Stine’s other creations: The Ghouls from Attack of the Graveyard Ghouls, Snake Lady from Escape from the Carnival of Horrors, Bog Monster from You Can't Scare Me!, Egyptian Princess from Return of the Mummy, Cronby the cave troll from Deep in the Jungle of Doom, The Evil Clown from When the Ghost Dog Howls, Vampires from Vampire Breath, The Witch Doctor from Deep in the Jungle of Doom, Madam Doom from Help! We Have Strange Powers!, The Executioner from A Night in Terror Tower, The Pirate from Creep from the Deep, The Creeps from Calling All Creeps, and The Haunted Mask from The Girl with the Haunted Mask. Also appearing in the film are Scarecrows from The Scarecrow Walks at Midnight, Jack O’Lantern from Attack of the Jack O’Lanterns, The Mummy from Return of the Mummy, The Abominable Snowman of Pasadena, The Werewolf from Werewolf of Fever Swamp, The Gnomes from Revenge of the Gnomes, The Blob from The Blob That Ate Everyone, Toy Robots from Toy-Terror: Batteries Included, Bug-Eyed Aliens from Invasion of the Body Squeezers, Vampire Poodle from Please Don't Feed the Vampire!, and the Praying Mantis from A Shocker on Shock Street. As Zach starts learning about the strange family next door, he soon discovers that Stine holds a dangerous secret: the creatures that his stories made famous are real, and Stine protects his readers by keeping them locked up in their books. When Stine’s creations are unintentionally released from their manuscripts, Zach’s life takes a turn for the weird. In a crazy night of adventure, it’s up to Zach, Hannah, Champ, and Stine to team up and get all of these figments of Stine’s imagination – including Slappy the Dummy, the girl with the haunted mask, the gnomes and many more – back in the books where they belong to save the town. Opening across the Philippines in October 21, 2015, “Goosebumps” is distributed by Columbia Pictures, local office of Sony Pictures Releasing International.